Hello everyone, it is Neftali here one final time. I have decided to step down from the team the month of September after working an entire year with all the amazingness that Florence challenges us here at In The Scrap. It has been an honor to be able to share my love for paper crafting and scrapbooking through these months and I hope that my creations have inspired you all a bit to get crafty. My passion has always been to inspire after the creating. So, having this world wide platform to do so, has been nothing short of amazing. I don’t have a new project for this post, but I simply wanted to take one last moment to head through memory lane and share a few of my most favorite projects created for this blog and the monthly challenges, so I hope you really do enjoy. A second favorite layout was the one I made for the “paper strips” challenge. This one is a favorite because of the scalloped strips I used, and the major Fall feels of the layout. I even have a YouTube process video for this layout, which you can find here. A third favorite layout was the one I created for the “grids” challenge. This one is always a favorite technique of mine because there are about a million ways you can create with a grid design. For this project I opted to go for a color-on-color technique as well, and had a blast using my Dear Lizzy supplies. A fourth favorite layout was the one I created for the “minimalist” challenge. This one I think is my top favorite! It was around the Christmas season so I made the simplest Christmas tree I could using crepe paper and only a handful of embellishments. I just love it for its simplicity! And a fifth, and final, favorite (because I can just keep going with this list! Haha) is the one I created for the “scraplift Steffi Reid” challenge. 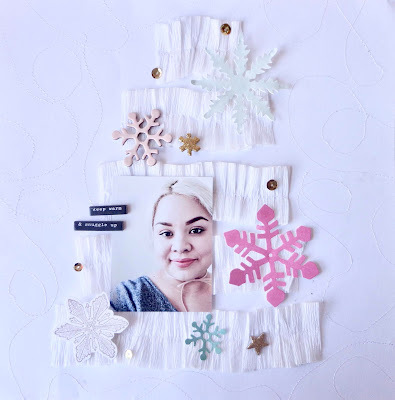 Steffi Reid has to be one of the biggest inspirers of the scrapbooking community, and I have my Pinterest board just filled with her creations. For this scraplift challenge I decided to lift the layout where she uses an entire photograph to scrap on. I mean, genius! Have you ever scrapbooked on top of an entire photo? It’s revolutionary! And I loved the end result of my own personal take. So, friends, it has obviously been a year full of challenges that have pushed my limits as a creator and flexed my scrappy muscles. I can’t thank Florence enough for allowing me this opportunity to be part of the in The Scrap Design team. I wish her the best of luck with the blog and her future goals, as well. One last goodbye, readers and as always, stay crafty!!! ¡Gracias por dejarnos tu comentario!